Driving in Los Angeles: TRIP study show bad roads, bridges and traffic cost drivers $2,500 a year. Now, this is a road to nowhere. A new report from TRIP, a Washington, D.C., transportation research group, finds that Los Angeles motorists are each spending an extra $2,458 per year due to poor roads and bridges. And that’s just the City of Angels. 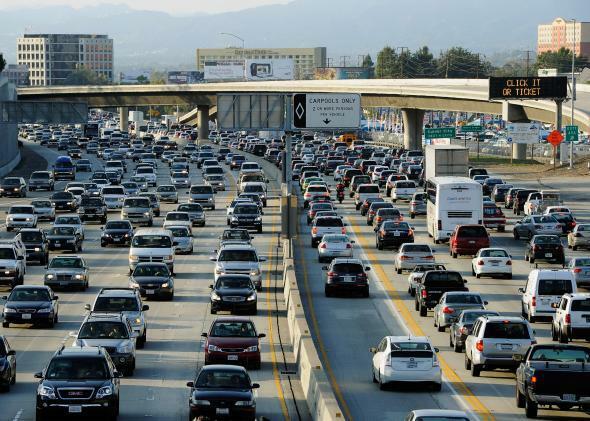 “Roads and bridges that are deficient, congested or lack desirable safety features cost California motorists a total of $44 billion statewide annually,” the report concludes. With a current unemployment rate of 7.4 percent and with the state’s population continuing to grow, California must improve its system of roads, highways and bridges to foster economic growth and keep businesses in the state. In addition to economic growth, transportation improvements are needed to ensure safe, reliable mobility and quality of life for all Californians. Meeting California’s need to modernize and maintain its system of roads, highways and bridges will require a significant boost in local, state and federal funding. Thirty-four percent of California’s major roads and highways have pavements in poor condition, while an additional 41 percent of the state’s major roads are rated in mediocre or fair condition and the remaining 25 percent are rated in in good condition. Driving on rough roads costs all California motorists a total of $17 billion annually in extra [vehicle operating costs]. Costs include accelerated vehicle depreciation, additional repair costs, and increased fuel consumption and tire wear. In addition to flat tires from potholes, poor road conditions are also costing motorists in the Golden State time. Los Angeles and San Francisco-area residents are no strangers to traffic, but they probably won’t be happy to learn that drivers in and around both cities are losing 61 hours a year to congestion. That’s more than two days. California is carland, but I can identify with whatever astonishment the people who live and drive in the state are experiencing, given TRIP’s findings. I lived there for a decade and saw firsthand a lot of the decay, and suffered through the traffic delays on a regular basis. In a state whose economy is bigger than most countries, this is a major challenge.